Many prepared food products would quickly foul normal types of heat exchangers, because they’re viscous or sticky, contain particles or alter state when heated. The new generation of Contherm scraped-surface heat exchangers from Alfa Laval is updated with four new performance enhancements that extend the capabilities of the Contherm range. This means enhanced food safety initiatives, even more gentle treatment of the product and improved resistance to wear and chemical corrosion. An upgrading service named, ConthermFlex, is also available. This gives customers with old scraped surface technology an opportunity to upgrade their equipment. Finally, there’s a newly developed, larger Contherm 6 x 11 with 15 % more surface area and up to 25 per cent more capacity than traditional sizes. new blade materials with improved physical properties compared to traditional blades. These include a unique detectable polymer that enhances food safety and food security initiatives. a new three-inch tangential head, designed specifically for sanitary and food-processing applications, improves product quality by treating it more gently. It is available as an option for new Contherm heat exchangers or as a retrofit. the new Alfaloy cylinder coating is a thin diamond-impregnated material that offers improved resistance to wear and chemical corrosion. Alfaloy is a cost-effective, FDA-compliant material that extends the service life of the Contherm’s other components. The Contherm SSHE can be modified to form the Convap evaporator, which is particularly suited to concentrating viscous products. The system normally operates under vacuum. 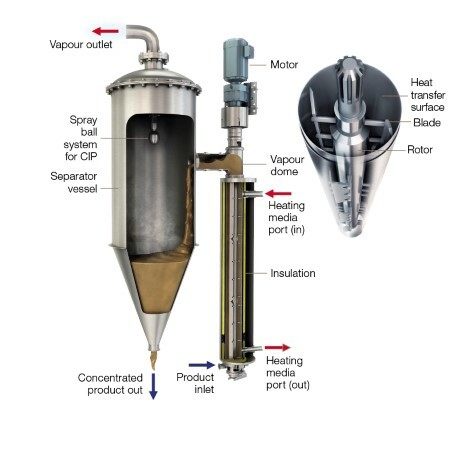 The entrainment separator connected to the SSHE by means of a specially designed vapor head allows the separation of the concentrate from the vapor phase. The Contherm scraped surface heat exchanger range is able to deal with the kinds of products where other types of heat exchangers are known to clog or foul. See how it works in below animation, showing some of the unique features you will obtain by using a Contherm. In scraped-surface heat exchangers, the product enters the cylinder at the bottom and flows upwards. The heating or cooling medium travels in a counter-current flow through a narrow annular channel. 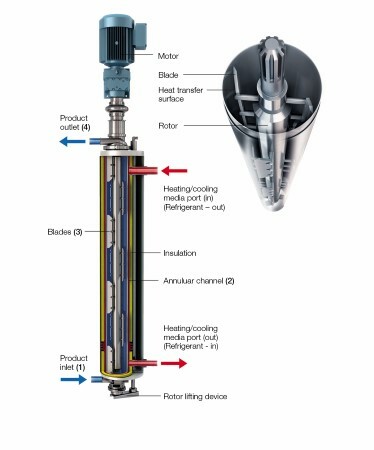 Rotating blades continuously remove product from the cylinder wall to ensure uniform heat transfer to the product. The product enters the cylinder in a corkscrew pattern in the same direction as the rotating part. 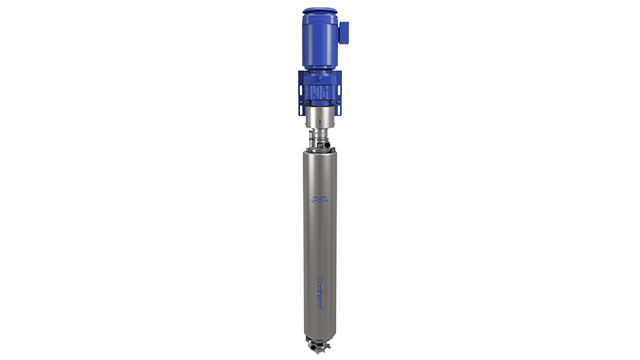 This preserves product quality by providing a larger flow area, gentler product handling and reduced pressure drop across the inlet.The food product finally leaves the cylinder at the top. Both product flow and rotor speed can be varied to suit the particular properties of the product in the cylinder. Rental units are also available. For reasons of confidentiality, if you prefer to carry out processing trials using Contherm in your own plant and with your own personnel, we can offer you a Contherm test unit on a rental basis along with qualified Contherm personnel during start-up. Just as in Contherm units, product is pumped into the lower end of the Convap heat exchanger cylinder. The heating/cooling media flows in the annular space between the heat transfer wall and the insulated jacket. Mechanical agitation, provided by the revolving blades, creates the convection conditions essential for efficient heat transfer. The scraping blades continuously remove the thin product film from the precision-finished cylinder wall. The centrifugal action of the Convap rotor, driven by a motor on the upper end of the unit, spins the heavier liquid droplets toward the cylinder wall. This action assures a continuous re-wetting of the heat transfer surface and prevents product burn-on. For further information, please contact Alfa Laval at e-mail address: info.contherm@alfalaval.com or your nearest Alfa Laval sales office.